You know me. I love peanut butter. I didn't really like it when I was younger. I think the occasional Ants On a Log or the classic peanut butter cookie made me pretty satisfied. On a side note, I did love this Sesame Street clip about peanut butter...I digress. Now, that I've had 3 children, my cells have changed; adapted to peanut butter cravings. Now I can't get enough. I love peanut butter especially with chocolate. No. I really love it. So, when I saw this recipe for Peanut Butter Brownies on Bakerella's blog, I knew I had to try it. Combine dry ingredients and stir with whisk. Set aside. Now measure 1/2 cup peanut butter. 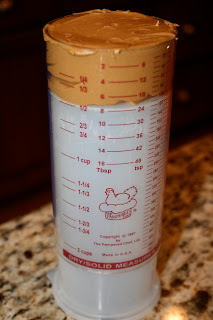 I always use my Pampered Chef dry/solid measure for peanut butter and shortening. It makes my life so much easier. Just press the bottom, and the peanut butter pops right out. Looooove it. Plop your peanut butter in the bowl. Mix well so it looks a little like this. Now add your dry ingredients a little at a time until incorporated. Now add semi-sweet chocolate chips and mix them in. Pour in a greased 8x8 inch pan. Bake at 350 for 35-40 minutes. Mmmmmm. So delicious and satisfying. Preheat oven to 350 degrees and grease an 8 X 8 pan. In a medium bowl, stir the flour, baking powder and salt together with a wire whisk and set aside. In a mixer, cream the butter and peanut butter until smooth. Add the sugars and mix until combined. Add the eggs and vanilla and mix until combined. Add the dry ingredients and mix on low until combined. Stir in the chocolate chips. Spread in the pan and bake for 30-35 minutes or until done. Notes: I baked these for 35 minutes but they really needed a few more for the center to be completely done. So to avoid the top turning too brown, place a sheet of aluminum over the pan about halfway through baking. Or you could bake them in a 9 X 13 inch pan for a few minutes less and get more brownies too. 0 Response to "Peanut Butter Brownies"